Women in all of these situations are good candidates for a breast augmentation. In addition, breast augmentation can be combined with other procedures such as a tummy tuck or liposuction to further enhance your natural beauty. Dr. Galumbeck is an expert in breast augmentation, and provides women with the the newest surgical technologies in a safe and relaxing environment. His desire is that every patient would feel beautiful, empowered, and confident after her procedure. Great plastic surgery results start with access to choices, which Dr. Galumbeck provides for his patients. Dr. Galumbeck was recently named an Ideal Implant Premier Surgeon because he is one of the top surgeons in the nation to provide the newest breast implant, the IDEAL IMPLANT® Structured Breast Implant. If you’re meeting with your plastic surgeon to discuss breast augmentation, what should you expect? 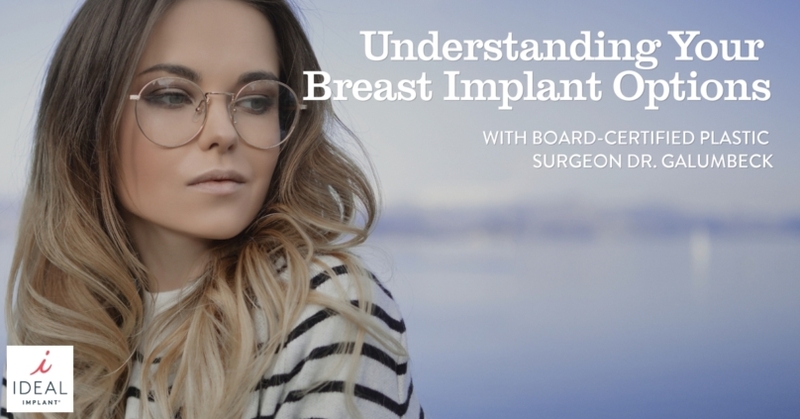 Dr. Galumbeck tells us, “One of the biggest options that women have now is the type of implant for breast augmentation that they can use.” Many women don’t realize there are options when it comes to breast implants. In fact, your choice of breast implant can have a lasting impact on your lifestyle so it is important to choose carefully. Saline breast implants are made from silicone shells filled with saline (sterile salt water). As Dr. Galumbeck explains, they were the only implant choice for many years. “So, originally all we had was the saline implant. The advantage of the saline implant is that if it leaks, it is all absorbed by the body. The problem with this is it has no structure, so it can ripple. It’s not a very natural feel or very natural look.” Women still love the peace of mind they get with saline breast implants. Because the saline is absorbed, there is no need to worry about complicated surgery to remove it if the implant ruptures. However, women began moving away from this choice when silicone gel breast implants became available because of the aesthetic concerns. Dr. Galumbeck explains why women liked the silicone gel breast implant when it was first introduced, “In 2007, the silicone gel implants came out and the advantage is that because it’s more cohesive, it has a more natural look, more natural feel.” Silicone gel is a thick, sticky substance that provides more stability to a breast implant than saline. The result is an implant that does not ripple or wrinkle and looks natural. Since the FDA approved silicone gel breast implants they have grown in popularity. However, these implants have a downside which Dr. Galumbeck explains, “The disadvantage is that if it leaks, the silicone gel stays in the breast tissue and so you can’t tell that its leaked with a ‘silent rupture.’ The FDA actually recommends that women get MRIs every three years to look for leakage.” Women do not like the hassle and expense of repeated MRIs, which cost on average between $444-$1468. In addition, the anxiety caused by not knowing the status of their breast implants can be a daily stress for some women. Breast augmentation is not without potential complications. Additional surgeries may be required to address complications such as rupture, capsular contracture, or cyst removal. According to the FDA, rupture and capsular contracture are two of the top reasons for breast implant revision surgery. The breast implant you choose can give you a statistically higher or lower risk of needing a revision. Knowing statistics on rupture rates and capsular contracture rates can help you plan financially and prepare mentally for the possibility of additional breast surgery. Unfortunately, many women are not aware of the high rates of complications with silicone gel breast implants. For primary augmentations, silicone gel breast implants have a capsular contracture rate of 10.9-16.2%, and a rupture rate of 7.2-13.6% in 7-8 year trials. Ruptured silicone gel breast implants can also lead to other complications. The FDA lists these possible complications as, “a decrease in breast size, change in breast implant shape, hard lumps over the implant or chest area, an uneven appearance of the breasts, pain or tenderness, tingling, swelling, numbness, burning, or changes in sensation.” It is important to get the recommended MRIs every three years to check for a silent rupture before it turns into a larger issue. When you’re considering your breast implant options make sure you get all the facts. Talk with your surgeon, look at before and after pictures, and feel the difference for yourself in your surgeon’s office. Educating yourself, especially when it comes to common complications such as rupture and capsular contracture, will help you make an informed decision. Choose an option that makes you feel beautiful, and leaves you without anxiety for the future. Preoperative Markings: These markings ensure your breast implant is placed properly. IV Anesthesia: A physician anesthesiologist gives intravenous anesthesia. Incision: An incision is used to gain access to breast tissue. There are four choices for incisions—axillary, periareolar, inframammary, and transumbilical. Creation of the Breast Pocket: A pocket is created to place the implant into. Dr. Galumbeck uses an endoscope to allow for precise dissection. Inserting the Breast Implant: The breast implant is inserted into the pocket. Final Check: Surgeon checks to make sure breasts are symmetrical. Incision Closure: The final step, closing the incision with methods to minimize scarring. Dr. Galumbeck uses the newest surgical technology to provide safe and efficient breast augmentations for his patients. His training and experience provide him with the knowledge needed to minimize risks and complications. The result is a natural and beautiful looking breast augmentation. Is the plastic surgeon board-certified in plastic surgery? See before and after pictures of that physician’s patients. Board-certification by the American Board of Plastic Surgery is especially important to ensure great results. Surgeons who maintain their board-certification are committed to providing a high standard of care and staying up to date with medical research. Before scheduling a consultation you should check out online reviews to see what past patients have to say about the surgeon. Websites like RealSelf, Facebook, or Google have real patient reviews. Finding a skilled and experienced board-certified plastic surgeon is the first step toward a new you. If you’re in Virginia Beach call Dr. Galumbeck to set up your complimentary breast augmentation consultation. Dr. Galumbeck was trained at Case Western Reserve University and Eastern Virginia Medical School. He also received advanced body contour training in Paris. In addition to his plastic surgery practice, Dr. Galumbeck founded and serves as the medical director of Spa Phoenix, the area’s first doctor directed medispa. Dr. Galumbeck prides himself on providing safe and efficient cosmetic procedures that get his patients the results they want. Considering breast implants in Virginia Beach? Contact Dr. Matthew Galumbeck today to discuss your options. Simply call (757) 491-3204, or visit www.galumbeckplasticsurgery.com. Dr. Galumbeck’s office is located at 1817 Republic Road, Virginia Beach, Virginia 23454 US. Call today for more information on IDEAL IMPLANT® Structured Breast Implants.